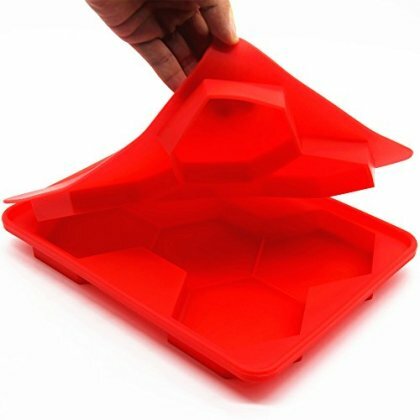 EASY and QUICK: Just fill ingredients in tray, place lid over bottom tray and press down the lid to flat the patties or whatever soft food you want, then put in freezer or cooler so its ready for your next fun barbecue! FDA APPROVED & BPA FREE: Dishwasher safe and the temperature conditions while operating is from -40 to 450 F. This hamburger press is non stick too! STUFF 5 QUARTER POUND PATTIES AT A TIME: Also, this Awesome burger press prevents your patties from getting freezer burn when keeping in freezer. THIS BURGER PRESS CAN MAKE MORE THAN BURGERS: You can use this as a freezer container for any soft foods you may want to portion out such as: chili, gravy, or stew. Need to find a gift? Give this to your loved one as a part of a barbecue grill set. The sky is the limit with this silicone burger press!